Cousins wasn’t perfect, but he’ll only get better from here. Wave the white flag. This one’s over. 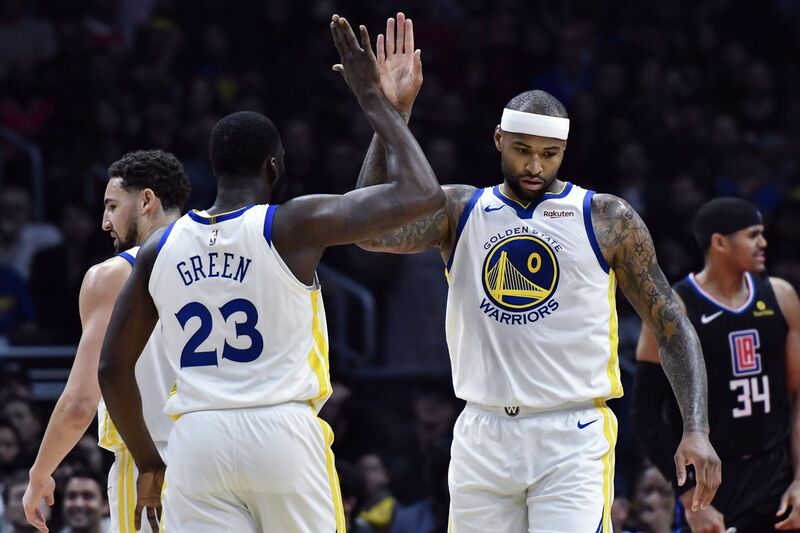 DeMarcus Cousins played in his first NBA game since tearing his Achilles as a member of the New Orleans Pelicans last season, then subsequently signing a free agent contract with the Golden State Warriors over the summer. It was a highly anticipated return that reminded the world the Warriors added one of the best big men in the NBA to a team that has won three championships in the last four years. Cousins scored the first basket of the game after rolling off of a screen he set for Kevin Durant. He finished with a vicious one-handed tomahawk dunk that sent the Warriors’ bench jumping into the air. DeMarcus Cousins’ first basket in 357 days came on a thunderous dunk. Boogie finished the night with 14 points, six rebounds and three assists. He shot 3-of-4 from three-point range, adding another deep threat to a team already loaded with perimeter snipers. according to ESPN Stats & Info, and the 50th time he’s fouled out — twice as many as any player since his NBA debut in 2010. The Warriors outscored the Clippers by 21 in the 15 minutes Cousins was on the floor. He shot 5-of-11 from the field and got many of his threes on wide open looks. That’s what happens when you play on the Golden State Warriors. They move the ball around and have so many threats, somebody gets forgotten about. Boogie, of course, also had a few moments that went viral. He and Boban Marjanovic shared some laughs on the court. The Warriors were already destined for a Western Conference Finals appearance at the very least. Adding Boogie makes them as sure of a lock to reach the NBA Finals as they’ve ever been. Golden State had struggled to get production out of the center position this season. Its combination of Kevon Looney, Damian Jones, and Jordan Bell was only averaging 6.5 points, 4.7 assists and 1.8 assists per game. Boogie nearly doubled their production in his first game back despite playing only 15 minutes. His three threes on the night tied the number the Warriors’ center mix had combined for all season long. Warriors head coach Steve Kerr said he didn’t anticipate Cousins making three triples in his first game back, calling two of those shots the ones that broke the game wide open. Kerr also said he wasn’t surprised with how the Clippers defended Cousins. Marcin Gortat and Montrezl Harrell were often found defending the paint against cutters. That left Cousins free to pour on his threes from downtown, adding a layer to the Warriors’ offense they didn’t have before. Cousins admitted he’s still not in tip-top game shape, and he did foul out in almost record time. But this is an All-Star, one of the three best players at his position, who just set foot onto the court with four other All-Stars alongside him. If the Warriors had any problems before, Cousins’ arrival will solve them as he works his way back into shape. The rich just got even richer. The Warriors aren’t going anywhere.